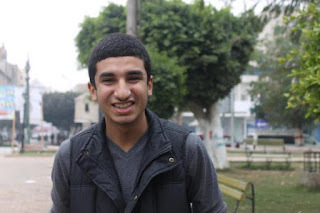 The movement of “No to Compulsory Military Recruitment” expresses its pleasure for accepting conscientious objection for the student Ahmed Mohamed Hassan Mohamed Arafa, the member of the movement, after receiving his personal academic file from his high school, without forcing him to exercise military trainings contradicting his pacifist beliefs. Ahmed Hassan is a student in “El Minya High School for Boys” and a peace activist who believed in ending the military rule over civilians, which continued for more than 60 years, penetrating all state institutions, using them to propagate its thoughts and orientations which undermine the principle of peace, which leads to turning civilians into benefiting tools for militarists in the continuation of their war machines. From this ideological point in which the movement of No to Compulsory Military Recruitment calls to and supports, Ahmed has boycotted the subject of the “Militarist Upbringing” which was imposed by the military establishment on the students in their civilian schools after the revolution of 25 January, who launched a campaign called “No to Militarizing Schools”, urging the students to boycott the subject which is taught by an officer from the armed forces, which should be passed in order for the students to obtain the high school certificate. But, surprisingly, the response of the school administration on that campaign was changing the panel which had the name of the school “El Minya High School for Boys” to “El Minya Militarist High School for Boys”. On the day of the exam of the subject of Militarist Upbringing, Ahmed Hassan went to stand in front of the office of the militarist in charge in school to inform him about his objection to do the the subject of the Military Upbringing for contradicting his ideological and political beliefs, so the decision of the army colonel, who is responsible for the exam, was to block out the high school official result from him and to summon him to spend 15 days for mandatory military training in summer at one of the military areas in the governorate. After that, Ahmed Hassan made a request to the military adviser in El Minya governorate, mentioning in it the reasons for his objection on doing the exam of the Military Upbringing subject, based on his pacifist beliefs and for his refusal to militarize schools, in addition to his age was less than 18, therefore forcing him to do any military work is considered breaching children rights and the international agreements which Egypt signed. The high school result was blocked out from Ahmed Hassan on Tuesday 2012-7-17, till Wednesday 2012-7-25, when his result was announced and he was given his file, after he made a similar request to the director of the school. “No to Compulsory Military Recruitment” movement helped in attracting the international attention to the case of Ahmed Hassan, which represents an important step confronting militarizing schools, additionally it is a peaceful action resisting the deviating of the Egyptian army from the international legitimacy by forcing minors to do military trainings. That’s why, many of the leadership of the movement informed many of the United Nations officials and the European Union, also it was mentioned in many of the public lectures in Europe and the United Stated. The movement welcomes Ahmed Hassan for his bravery and his hanging on to his ideas and principles, and on confronting the penetration of the military establishment in the daily life after the military coup. The movement also calls on the Egyptian military to be committed to the international laws and to stop any military trainings for minors under 18 years old. The time has come to cleanse the Egyptian schools from all the forms of militarization and militarism. Click on the CC button on the video if the subtitles do not appear.